Home » Blog » Water Has More Benefits than You Think, Are You Getting Enough? Dehydration: In the hot summer climate, your body requires more water just to maintain normal functioning. Even becoming slightly dehydrated can significantly compromise your health. 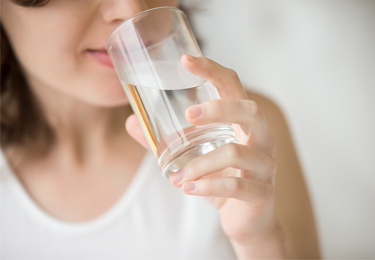 If you experience weakness, dizziness, dark urine output or a dry mouth, it is time to increase your water intake. Heat Stroke: After a cold winter season, most people enjoy soaking up the sun during the summer and tend to be more active. Drinking plenty of water will keep your body cool and help safeguard you from heat exhaustion or sun stroke. Sunburn: It is very easy to get a sunburn if you are not careful in the summer. Drinking water helps replenish fluid loss that occurs through sunburned skin. Dry Skin: If you prefer to remain indoors with the AC on in the summer, you still need to drink plenty of water to prevent drying of skin that occurs due to lack of moisture in conditioned air. Headaches: Too much fun and games in the sun without being adequately hydrated can leave you with a splitting headache. Drinking plenty of water will relieve fatigue and prevent headaches from occurring. Glowing Skin: Achieving the sun kissed bronzed look while keeping your skin moist and spot free is a balancing act that requires a lot of hydration. The best way to do that is by increasing your water intake. Beach Body: Drinking plenty of water can help you get in shape. It fills you up while reducing hunger pangs and helps prevent muscle fatigue allowing you to put more effort into your workouts. Drink a minimum of 8 glasses of water each day. It is a good idea to carry a bottle of water with you wherever you go and keep taking a few swigs from it throughout the day. This will help you maintain a sunny disposition while keeping cool in the summer.